On September 24th, President Obama will officially dedicate the National Museum of African American History and Culture on the National Mall. Tucked into one of the inaugural exhibits, "A Sense of Place", is a section on the cultural importance of Oak Bluffs in the African-American cultural landscape; several of our patrons' family artifacts will be shown. We at the OBPL thought this was a perfect time to launch a festival celebrating our town's rich traditions. The Festival will celebrate a variety of Black writing and culture with both visiting and local speakers. We will highlight in particular people and ideas with a connection to our town's unique community. 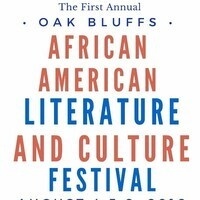 Please join us in honoring these writers, historians, and artists for the first annual OBAALCF. Featuring Kevin Parham, Cheryl Finley, Jessica Harris, Reggie Wilson, Duncan Caldwell, The Cottagers, Robert C. Hayden, Caroline Randall Williams, Don West + Kenneth Cooper, Alice Randall, MV Spirituals Choir, and a viewing of Ted Joans collages.